He was born in Lahore, Pakistan, and his family moved to Tallahassee in 2009. Rasul attended Leon High School and began to consider opportunities to attend a university in the United States. Now, Rasul is finishing a double major in media/communication studies and psychology, and he’s focusing on academic research that would be beneficial in a career. In fall 2016, Rasul was accepted to the Undergraduate Research Opportunity Program, and the experience sparked his interest in media studies research. He worked under the guidance of Stephen McDowell, associate dean of student affairs in the College of Communication and Information. In 2017, Rasul was awarded an IDEA Grant from the Center for Undergraduate Research and Academic Engagement. 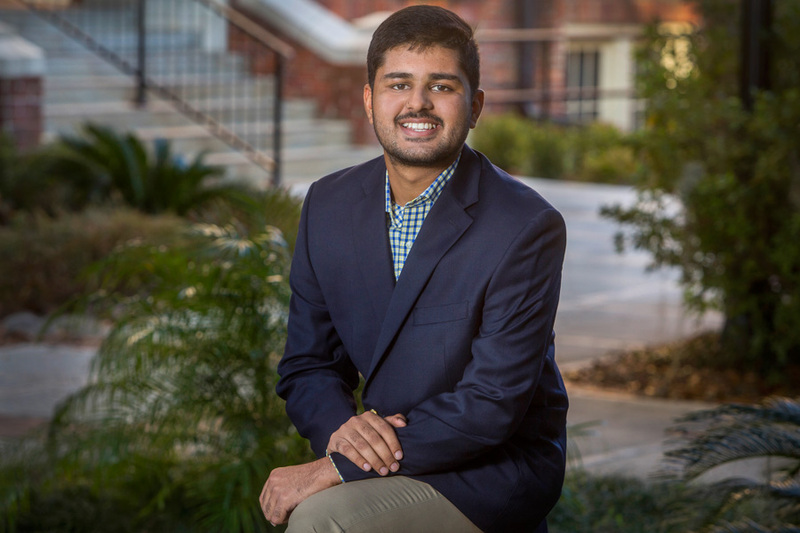 With the $1,000 award, Rasul researched how female politicians were portrayed in films produced in Hollywood, as well as the Indian movie industry, and he examined whether those representations impacted people’s perceptions of women in politics. Rasul presented his research at the FSU Showcase of Undergraduate Research Excellence in fall 2017. This year, Rasul has continued to dive into South Asian Media and Cultural Studies with the help of a second IDEA Grant. The award allowed him to travel to Pakistan to research how Pakistani and American newspapers reported drone strikes and civilian casualties from the perspective of the “moral disengagement theory,” which contends a person might be more willing to break certain ethical standards depending on the context of a situation. Under the guidance of Arthur Raney, the James E. Kirk Professor of Communication in the College of Communication and Information, Rasul investigated how media psychology theory is used to undermine civilian losses in the war on terror. In his research, Rasul has compared, contrasted and tried to bridge a gap of understanding between western and eastern cultures by analyzing each culture’s use of media. Rasul has presented his work at national and international conferences, such as the Conference of the International Communication Association held in Prague this year. Outside the classroom, Rasul is passionate about the sport of cricket. His enthusiasm for the game and natural leadership skills prompted other students to join him on the field, which led to the creation of the FSU Cricket Club. As president of the Cricket Club, Rasul gained leadership and organizational skills, while educating others about his native culture. He lived in Pakistan until the age of 11 before moving to the United States, and that experience gave him a unique perspective. In the future, Rasul plans to attend graduate school and pursue a doctorate in media psychology and health communication. He’s preparing for a career with a research company, think tank or as a professor at a research university. Rasul said his undergraduate research work has shown him career possibilities and helped him prepare for graduate school. Overall, he said his FSU experience has boosted him both personally and academically.